Denver, Colorado (Embargoed until 9:30 A.M. MT, Wednesday, June 14, 2017) – An estimated one in seven American men will be affected by prostate cancer in their lifetime. Prostate-specific molecular imaging gives these men a fighting chance, especially if their cancer returns, according to research revealed at the 2017 Annual Meeting of the Society of Nuclear Medicine and Molecular Imaging (SNMMI). This is the first prospective study to include far-reaching data from four Australian medical centers and several hundred patients examined over the course of 18 months. For this study, prostate cancer patients underwent PET/CT—a combination of positron emission tomography and computed tomography. This groundbreaking research shows that prostate-specific molecular imaging led to the detection of cancer that had not been caught by more conventional imaging. Prostate-specific PET/CT subsequently changed the course of treatment plans for 51 percent of patients. “Prostate-specific PET/CT is a game changer in the evaluation of patients with prostate cancer and has been consistently shown to represent a substantial improvement over conventional imaging for the staging of disease,” said Paul J. Roach, MBBS, head of the Department of Nuclear Medicine at Royal North Shore Hospital in Sydney, Australia. 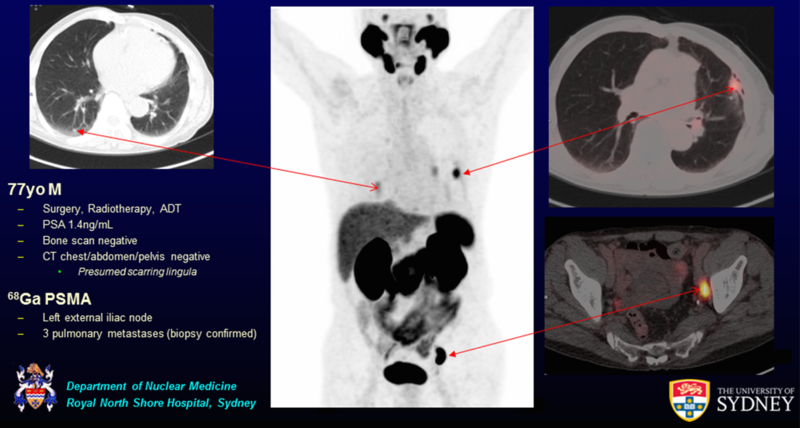 Nuclear Medicine specialists performed PET/CT in concert with an injected imaging agent comprised of a tiny amount of a radioactive material called gallium-68 (Ga-68) and a molecular compound called prostate specific membrane antigen (PSMA). Once administered, the agent zeros in on areas where the PSMA protein is being over-expressed on cell surfaces—including cancer that has spread from the prostate to other organs. The radioactive markers distributed across these areas of PSMA over-expression emit a signal that is picked up by the PET scanner and used to create a highly accurate map of disease. Referring physicians completed intended treatment surveys prior to PET/CT imaging and once again after the results of imaging were in for a total of 431 patients in this study conducted between January 2015 and June 2016. The change in clinical management was especially remarkable in patients showing signs of recurrent disease—61 percent of treatment plans overall, including 69 percent for patients who had received radiation therapy and 64 percent of patients who had undergone surgery. Conventional radiographic imaging did not detect disease in nearby lymph nodes in 39 percent of patients, in the prostate bed in 27 percent of patients, and in regions where the cancer had metastasized, in 16 percent of patients. Primary screening of intermediate and high-risk prostate cancer led to a change in clinical management in 23 percent of cases. This and further research could provide the data needed for governments to fund and insurers to approve this new advanced molecular imaging procedure. Prostate cancer is the second-most prevalent form of cancer in men in the United States, according to the American Cancer Society. Approximately 161,360 new cases of prostate cancer are estimated for 2017 and as many as 26,730 American men are expected to die from the disease this year. Scientific Paper 706: “Clinical management intent of Ga68 PSMA PET/CT imaging in prostate cancer: an Australian multicentre study,” Paul J. Roach, Royal North Shore Hospital, St. Leonards, Australia; Roslyn Francis, University of Western Australia, Perth, Australia; Louise Emmett, University of New South Wales, Darlinghurst, Australia; Michael McCarthy, Fiona Stanley Hospital, Perth, Australia; Andrew M. Scott, Austin Health, Melbourne, Australia, SNMMI’s 64th Annual Meeting, June 10–14, 2017, Denver, Colo.